Showing off a unique helmet design, the Lincoln Electric Viking 3350 Black Welding Helmet is known for passing the EN379 standards for clarity and optical performance, having a perfect 1/1/1/1 optical clarity. Among the Viking series of Lincoln's products, this one has the biggest viewing area so far. Giving you a user friendly approach in controls, the Lincoln Electric Viking is great for both hobbyists and professionals at a quality price. It auto darkens greatly and if you are looking for an upgrade from a cheap, entry-level helmet, you can go with this one and you will definitely feel the difference. You will also definitely love the optical clarity with this auto darkening welding helmet. Some helmets of this level aren't very cheap so this is a great buy for beginners or hobbyists who want to save a couple of dollars and still get the same kind of clarity they want during welding. Its shades come in DIN 6 - 13 and a grind mode. The sensitivity and delay can be adjusted well, with a 0.00004 second delay or switching time for light to dark, and 0.1 sec. min. - 1.0 sec. for dark to light. The quick switching will guarantee you safety from flashes. Other than the 1/1/1/1 high standard optical clarity, it also complies with ANSI Z87.1 standards and CSA Z94.3 so you are surely guaranteed with a professional standard. Great for upgrading cheaper helmets: like what was mentioned above, if you are looking forward to upgrading an old school or entry-level helmet that you have most probably broken down as a practice helmet, it’s time to upgrade to the Lincoln Electric Viking 3350. High quality optics: having the 1/1/1/1 rating in terms of optical clarity, you will be very much thrilled with the professional gear’s results while welding on important details, for TIG, MIG and others. Quick switching time: this is a highly important part of having an auto darkening welding helmet. You need to avoid getting flashes and that’s why a fast reaction in switching from light to dark and vice versa is a useful safety feature. Long battery life: at an approximate battery life of 2,000 hours, you are sure to invest in the 3M Speedglas welding helmet, especially for those who work night and day and use it for industrial purposes. Quick battery draining / replacement: unfortunately, some users have reported that their batteries need to be replaced quicker than their other welding helmets more often. Battery life is important because should the battery run out, the auto darkening could cease to function during work which could spell trouble and flashing in the process. A bit heavy: it feels a bit heavier in comparison to other helmets. Maybe that is because it’s a lot cheaper so most of the special features seem to be crammed in to this helmet for a lower value. Nonetheless, it’s not as heavy as something that would easily strain your shoulders and head. Shiny black could get scratched: in some cases, you can be in tight welding spots which could possibly get the shiny black scratched or its reflection can cause glaring in your helmet. Some users would like it if the black material would be flat instead. · The operating temperature of the helmet is around 14 to 131 degrees Fahrenheit or -10 to 55 degrees Celsius. · The storage temperature is from -4 to 158 degrees Fahrenheit or -20 to 70 degrees Celsius. ​· The welding helmet weighs 21 ounces or 595 grams. ​· The max TIG rating is 4 amps. · The replacement lens are sized 4.5 by 5.25 inches or 114 by 133 millimeters. Q: If the lens doesn't work and flickers, could it get replaced using the warranty? A: Yes, but try replacing the battery first. You can also try charging the solar panel for longer periods of time. If it doesn't solve your problem, contact Lincoln Electric for the warranty information. Q: Does this version of the 3350 have the new head gear? Q: Where is the helmet made from? Q: Is a cheater lens applicable for this helmet? A: Yes, you can use a cheater lens. Q: Does this particular welding helmet have spare lenses? What else is included with the helmet? A: Yes, it has 5 spare lenses (outside), 2 spare lenses (inside) and a helmet bag. Q: Is there another helmet design variety for this model? A: You can look for welding supplies that could sell this Viking 3350 model with a different graphic design. 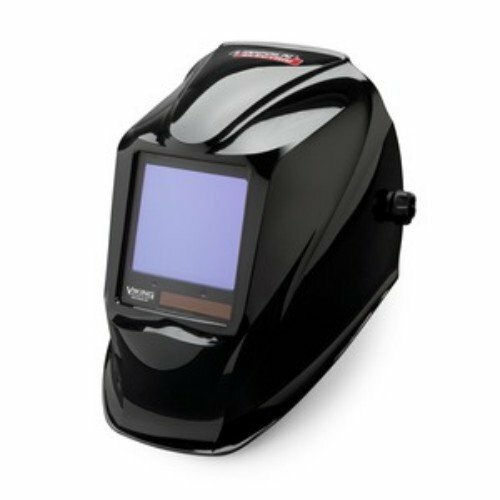 As a whole, the Lincoln Electric Viking 3350 Black Welding Helmet packs a lot of visual optical clarity at a very cheap price, so it is a great buy for beginners, intermediate welders and professional welders as well. You won't have a problem looking for extra lenses since this one's got a lot of spare in the package. The Viking 3350 is a sure winner if you are more concerned about the price and the quality alike.